Soy protein, derived from soybeans, is a common food allergy in children that is usually outgrown by the age of three. Recently, however, children are not outgrowing the allergy so it is now seen more frequently in adults. The initial reaction typically occurs in infants after switching to a soy-based formula due to an allergic reaction to a milk-based formula. Some people who are allergic to soy may also be allergic to legumes such as peas, peanuts, lentils and garbanzo beans (chick peas). Eating Out: When dining out, ask detailed questions about ingredients and how the food was prepared – your health and safety are at stake! There’s a high risk for cross-contamination in the kitchen so be sure to clearly express your food allergy to the server or cook. Ask to look at the food package if necessary. Be especially careful is restaurants that serve Asian cuisine, since soy ingredients are common. A new diagnosis can be scary. Be sure to build a support of family, friends and healthcare professionals to help you manage your soy protein allergy. 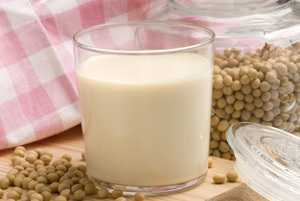 Soy foods are rich sources of protein, fiber, calcium, B-vitamins and iron. Soy products have recently become more popular, yet there are many people who never consume soy products. For this reason, avoidance of soy products has less of an impact on your nutritional status than other food allergies. Consider talking to a doctor or dietitian when eliminating any foods from your diet. They may recommend an adjustment in your meal plan or a supplement to replace nutrients lost by eliminating the offending food and food ingredients. Also talk to your doctor about how to prepare for a reaction. You may treat a mild reaction with oral antihistamines to reduce signs and symptoms and relieve discomfort. If you are at risk for severe reactions or anaphylaxis, your doctor may advise you to wear a medical alert bracelet and/or prescribe an injectable epinephren (EpiPen) to carry with you at all times.